France and Serbia played excellent ball, already winning the ties 3-0 with the German’s couldn’t handle Gilles Simon, Gael Monfils Julien Benneteau/Nicolas Mahut, and Croatia needs a much stronger team with Novak Djokovic, Viktor Troicki and Nenad Zimonjic, which nailing it down on Saturday. The rest of six vs. six teams will go on each other on Sunday at the Davis Cup. Who will win overall? It will be fairly close, but coming back 1-2 if very difficult. The US’s Bob Bryan/Mike Bryan over came Dominic Inglot/Jamie Murray 6-3 6-2 3-6 6-7(8) 9-7. Now the captain Jim Courier will tell John Isner exactly what he will do against Andy Murray. 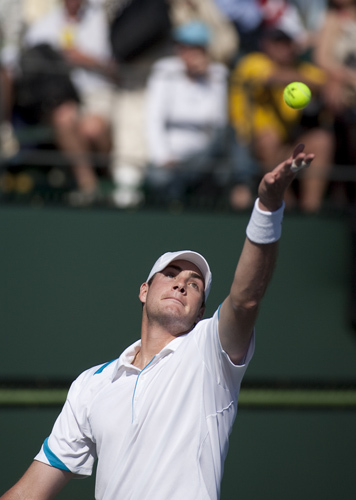 However, Isner admits that he is shaky this year and Andy will stay way back in the court so he could yank the tall man back and forth until he can’t run the balls down. The GB will win in four sets and move on to face France in the quarters. Can the Czech Lukas Rosol put down Bernard Tomic on Sunday morning? Perhaps, but Tomic wants to show the world that he is most important these days, not the teenagers-yet. However, if Tomic falls – which is down full– the young Aussie Thanasi might be a little tired, but he will out stroke Jiri Vesely to win it in five sets. Mikhail Kukushkin played very well at home to beat Simone Bolelli in the first match, but Bolelli and Fabio Fognini won the dubs. Kukushkin will wants to take down Andreas Seppi, but Seppi has been much better this year and he will win it by smoking his forehands by kissing the lines. Argentina is playing home and is down 2-1? Really? Joao Souza overcame Carlos Berlocq and then the excellent doubles team, Marcelo Melo/Bruno Soares, wasted Berlocq/Diego Sebastian Schwartzman 7-5 6-3 6-4. So let’s assume that Leonardo Mayer, who won on Friday, will beat Souza, but it seems like Argentina is anxious and this time Thomaz Bellucci won’t become extremely nervous (which he has all the time). Brazil will grab the 3-2 when Berlocq loses three matches in a row. Ouch. The Canada’s Daniel Nestor/Vasek Pospisil edged Go Soeda/Yasutaka Uchiyama 7-5 2-6 6-3 3-6 6-3 but it is wide open with all the players. Milos Raonic is playing Kei Nishikori a ‘pick-em’ and they know each other very well. Yes, the Japanese Nishikori has been slightly better in the past year, but Vancouver is very fast and Milos is more confident at home. It will go five sets, but Raonic will serve huge when it matters the most and win it 3-1. Everyone in Belgium was stunned that the Swiss Henri Laaksonen beat Ruben Bemelmans in five sets, but then Steve Darcis was extremely concentrated and Bemelmans/Niels Desein won the doubles pretty convincing. One would think that Darcis will grab the tie 3-1 when he mixes up his pace and beats Laaksonen in three sets.